Goodness, an entire week's worth of food posts! Well, we've all gotta eat, yes? Here's something to top off your homemade marinara sauce and pasta. These meatballs are heavy on the onion, which helps them stay moist, and they have a nice flavor depth due to the spices. After they're cooked, I oftentimes place them in the crockpot with marinara sauce until we're ready to eat. This also works well for parties, and topped with mozzarella, they also make great meatball sandwiches. 4. 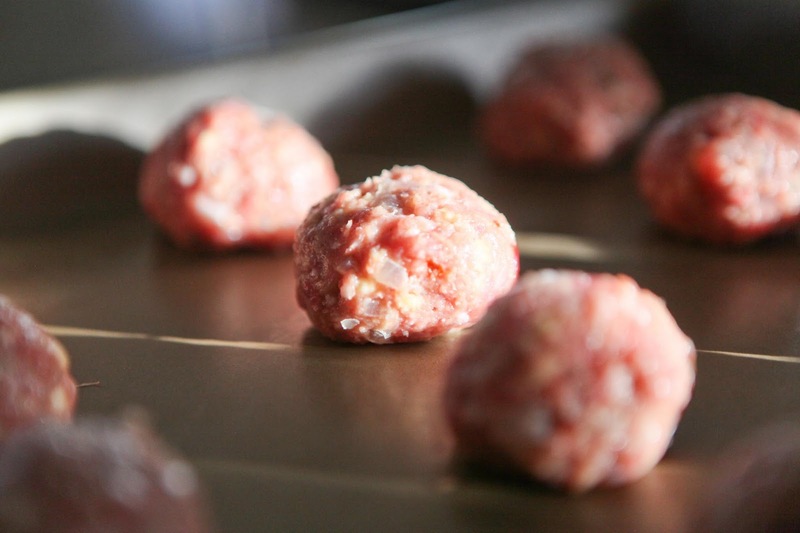 Form meatballs of your desired size, and place them on a baking sheet. Have a lovely weekend, friends, hopefully with some slow cooking going on! I use almost the same recipe, except with allspice instead of cinnamon. They are great! Thanks for this, Jamie! I made pasta today, inspired by your post, which we're having with pesto and sausage tonight. Next time, I'll make your meatballs (goodness knows we have plenty of ground beef AND pork!) to go with the homemade pasta. Have a wonderful weekend! Baked meatballs. What a concept. Seems like it ought to be obvious but I just kept on cooking them in a pan like always. Meatballs are an excellent thing to make plenty of, and freeze. Leigh, I should mention that I shake the pan/ flip the meatballs once while baking. I bet they would be wonderful coming out of your wood cookstove! Looks very yummy. I have never put cinnamon in mine...might have to try. 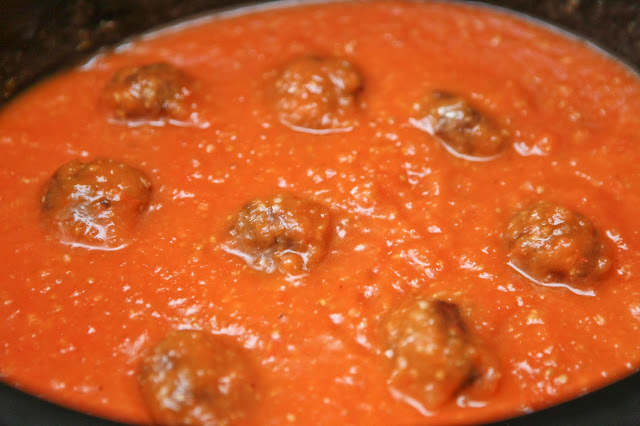 Also, just FYI, did you know you can put the formed balls right into the bubbling sauce before you cook them? They cook right in the sauce like dumplings, and they do not fall apart. Plus, they do not get a crust, which little chewers like. Just put them into the simmering sauce, cover, and cook about 20 minutes before you attempt to stir or taste. Thanks, Jeannine, great idea too! OK...now I am getting really hungary ~ I love meatballs and spaghetti! Keep on posting about food....you have great recipes and even better photos! Oh, good! There's certainly no shortage of food-related posts floating around in my head.